For our family date tonight, we went to my Grandma and Grandpa's house. Kelly made chicken fajitas for dinner. We brought all the fixings for dinner, including a very good cinnamon swirl creme cake that we picked up from Walmart on the way. I wondered what my grandparents were going to think of the dinner. I think they were a bit skeptical as we told them how to prepare the fajita. They were very much into reminiscing tonight. My Grandpa started by telling us that his last war buddy passed away before Christmas. He told us a couple different war stories and then talked about the reunions they had with his army buddies, including a trip they took overseas where they visited all the different places he had served. I had heard a few of these stories before but it's always interesting to listen to him talk about the war and what he saw. At one point tonight I saw a few tears run down his cheek. I have always appreciated the fact and been proud that he helped protect this free country we all enjoy. My Grandma joined in tonight by telling us all about what she did while my Grandpa was away. Oh yeah, this all started because she was telling us how they just celebrated their 68th anniversary. That is amazing but what is even more amazing is that they never even saw each other for 38 of the first 39 months of marriage. They went on their honeymoon and when they came back, there was a letter from Uncle Sam calling my Grandpa to war. Good thing they were such great friends before this happened. Anyway my Grandma told us how she went to machinery school in South Bend and how she was the first woman hired on the line at some machine shop. She excelled there and was excited when she got promoted so she could wear a blouse and skirt instead of her denim uniform. She told us how she made a C clamp using all different sort of machines and how for her final project she made my Grandpa a small ball-peen hammer that he wore on his dog tags. He said all the guys got a kick out of that. After dinner, Grandpa said he really enjoyed that meal. So I guess the fajitas were a hit. Now for the explanation for the picture of the day. I went out into my Grandma's kitchen and Kade came over to the cupboard and said, "I want to see what's in here." Funny thing is, I think he remembered what was in there. Let's just say there used to be some other little boy who always needed to see what was in that same cupboard. It's always full of all different kinds of cookies. So here is the little copycat. Those are neat stories about your grandparents. I've never heard his grandpa talk so much. It was a nice treat. I can't believe some of the things they endured, like no indoor bathrooms! I'm glad I didn't have to live in a time like that. Kade didn't end up with a cookie. He snatched a Swiss Roll. And still he munched on tortilla chips all the way home. He's going to be a big guy when he's done growing. I hope he doesn't eat as much as his uncles and papa. We'll go broke! Thanks for sharing about G&G! I remember the cupboard well and my girls know right where to go too. Have you read his life story? That was amazing too. Thanks so much for being a good grandson, I know they love it when you and your family come down. 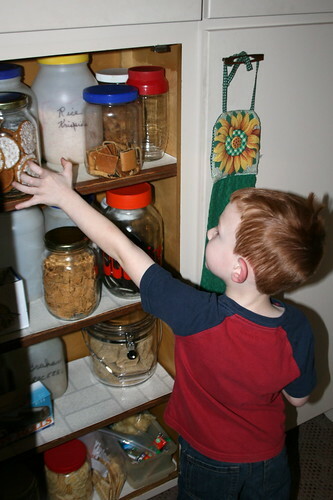 Yes, that cookie cupboard is really a popular one with the grandkids and great-grandkids. Somehow,I don't remember it being like that when I lived there. They do have a lot of stories and just love to have someone who is willing to sit and listen. Love you all - thanks!